Transparency International recently published ‘Corruption Perceptions Index 2011‘ which “ranks countries and territories according to their perceived levels of public sector corruption.” What is the toll of corruption on a country? One way to assess this is to see if an inverse relation exists between a country’s perceived corruption and its Human Development Index. (The HDI is a “way of measuring development by combining indicators of life expectancy, educational attainment and income.”) While I generally agree with Mark Twain — there are three kinds of lies: lies, damned lies, and statistics — the broader implications are clear: a country (state, organization) that plays fair does well. 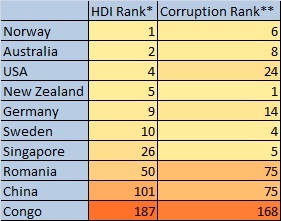 No wonder the US, UK, OECD and others continue to bolster initiatives to fight corruption. The UK Bribery Act will come into force April 2011 – “The Bribery Act reforms the criminal law to provide a new, modern and comprehensive scheme of bribery offences that will enable courts and prosecutors to respond more effectively to bribery at home or abroad.” More: www.justice.gov.uk/publications/bribery-act.htm. Risk assessment – this is about knowing and keeping up to date with the bribery risks you face in your sector and market. Top level commitment – this concerns establishing a culture across the organisation in which bribery is unacceptable. Due diligence – this is about knowing who you do business with; knowing why, when and to whom you are releasing funds and seeking reciprocal anti-bribery agreements; and being in a position to feel confident that business relationships are transparent and ethical. Clear, practical and accessible policies and procedures – this concerns applying them to everyone you employ and business partners under your effective control and covering all relevant risks such as political and charitable contributions, gifts and hospitality, promotional expenses, and responding to demands for facilitation demands or when an allegation of bribery comes to light. Effective implementation – this is about going beyond ‘paper compliance’ to embedding anti-bribery in your organisation’s internal controls, recruitment and remuneration policies, operations, communications and training on practical business issues. Monitoring and review – this relates to auditing and financial controls that are sensitive to bribery and are transparent, considering how regularly you need to review your policies and procedures, and whether external verification would help. Ethics? The Foreign Corrupt Practices Act Lay Person’s Guide states, “The FCPA prohibits corrupt payments to foreign officials for the purpose of obtaining or keeping business.” (See Guide: http://www.justice.gov/criminal/fraud/fcpa/docs/lay-persons-guide.pdf.) It is generally recognized that bribery is unethical (and illegal) in the US. The FCPA reminds travelers to add ethics to their do-not-forget list (or risk being put on DOJ’s not-so-friendly list). Regardless of place or circumstance, ethics is something you shouldn’t leave home without.